Created for people who follow the Caveman Diet (also known as the Paleo diet) who need a sweet treat, these Caveman Cookies are made of things cavewomen would eat: nuts, berries and honey. Totally natural, dairy-free, gluten-free, grain-free and with no refined sugar or preservatives, each cookie has about 75 calories and a few grams of protein. With a chewy texture, they’re much more dense and filling than most cookies. Must be all the nuts. This photo is seriously deceiving size-wise, as each cookie is a maximum of two bites. Unless you’re a toddler. 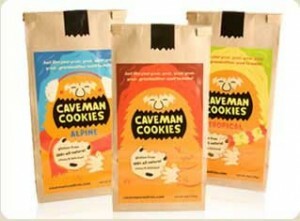 I tried the Original and Tropical Caveman Cookies varieties and found both to be good enough to not want to stop eating at just one cookie (gotta be the cavewoman in me), but would give the slight edge to Original, which is similar to an oatmeal-raisin cookie (just without the oatmeal). Tropical was good, too, with coconut and macadamia nuts, but when it comes to my cookie-preferences, I lean old-fashioned. 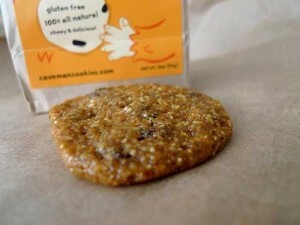 While still a treat, when it comes to cookies, you can’t get much healthier than these Caveman Cookies. Like the company’s clever tagline says, it’s just like the cookies your great, great, great, great, great grandmother used to make.Argh!! !